Product prices and availability are accurate as of 2019-04-12 03:11:25 EDT and are subject to change. Any price and availability information displayed on http://www.amazon.com/ at the time of purchase will apply to the purchase of this product. Complex, interesting, and unique vocal effects have driven hit songs and launched careers. iZotope’s VocalSynth is a truly unique vocal multi-effects plug-in, which makes hard to reach, professional vocal sounds easy to achieve. Shape, manipulate and engineer your voice to create electronic vocal textures, robot sounds, computerized digital harmonizing, and thick octaves or doubles. Uncover otherworldly sonic palettes or quickly access the famous vocal treatments of your favorite music recordings with preset audio effects. 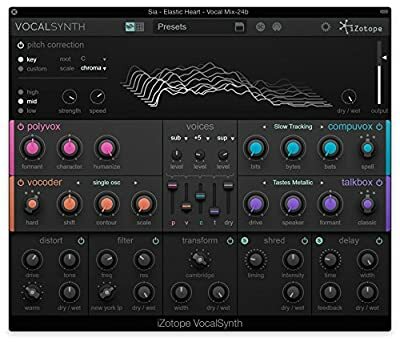 The VocalSynth plug-in features four re-synthesis engines - Vocoder, Polyvox, Compuvox, and intelligent vocal analysis which creates sounds exactly like a Talkbox without any external audio equipment. It also includes expressive vocal effects and simple, high-impact recording controls, and can work intelligently without MIDI for non-keyboard players but supports MIDI for advanced users. Ideal for musicians and producers of rock, pop, rap and electronic dance music who love interesting vocal sounds in famous songs and want to produce their own professional sounding signature vocals. 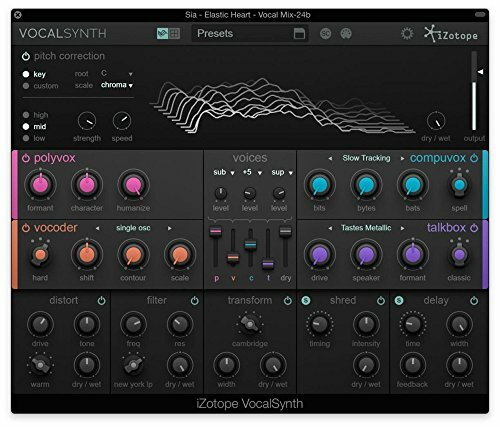 iZotope’s VocalSynth plug-in ensures an expansive array of vocal engineering awaits.